Dubai is unquestionably one of the hottest destinations for vacation and holidays. Being a super lively and vigorous multi-ethnic terminus, it welcomes tourists as well as flavors from all over the world. The emirate offers great sightseeing, fun places, clubs, bars, lounges, resorts, hotels and restaurants. It is also famous for hosting one of the biggest food festival, where people from all over the world come to enjoy the local and international food delight. Dubai is a global food arcade where you can enjoy one of the widest food varieties and can get the best treat for your dripping taste buds. Dubai proudly espoused all the big international food brands, along with the highest quality local food places. Dubai food industry is highly flourished and you may find an extensive assortment of brands, variety, flavors, price range and quality to choose from. Dubai has plenty of food places ranging from 5 star luxury hotels to beach-side barbeque houses that offer world-class mouth watering food. The city is also famous for its highly diverse luscious food menu among the tourists. From South Asian to Japanese to Chinese and Mexican, Dubai has the best assortment of the selected carte du jour. And impressively, no matter you get the food from a 5 star hotel or a kiosk, both maintains the superiority of food items and hygiene to assure you the finest quality. Alternatively, Dubai also has a reputation for its outrageously priced restaurant such as Burj Al-Arab and Al Mahara, which may cause you some hundreds of dollars merely for menu savoring; however, there are numerous buffet restaurants in Dubai, that offers you plenty of food at the most affordable prices. Here revealed are the best 5 buffet restaurants in Dubai that offers the best quality and reasonably priced buffet menu at breakfast, lunch and dinner. If you are a frilly eater than Anise is the right place for you. Their scrumptious main courses and mouth dripping cocktails here, is just out of this world. At Anise you may find the delectable variety of Asian, Middle Eastern, Arabian and Continental cuisines. Their lip-smacking lamb fillet, lamb chops, king prawns, Indian chicken curry and chocolate fondue are the premium food delicacies. Anise is located at the lobby level of Intercontinental Dubai Festival City. There are no words to express the flavor and quality of the food menu at Anise. The place offers casual dining and average meal cost for two is around AED 500 including starter, main course and drink. Serving hours are 6:30 am to 2:30 am for breakfast, lunch and dinner. Prior reservations are recommended. 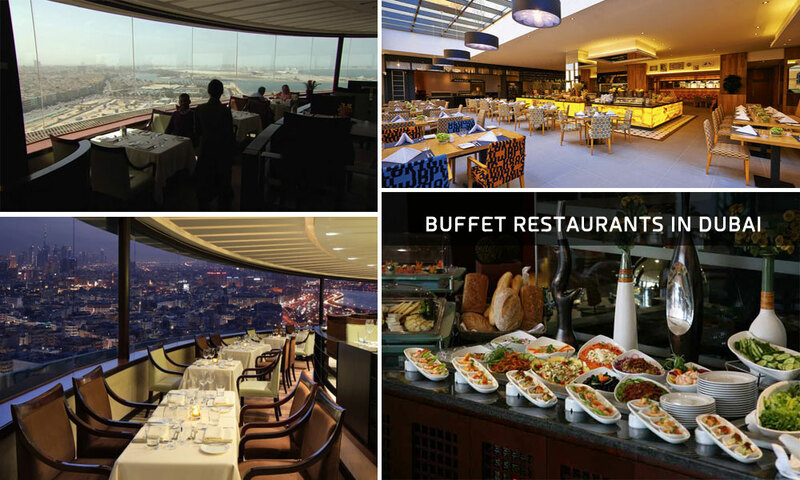 Al-Dawaar is the only revolving restaurant in Dubai and it offers mesmeric 3600 view of the city lights and shoreline. It is located on the 25th floor of the Hyatt Regency Dubai – Naif. The restaurant offers a great variety of Arabian, European, International and Middle Eastern Cuisines. Their salads and desert corner also brings the best miscellany. The place averagely costs you between AED 220 to AED 460 (for two persons). In particular, it costs around AED 235 for buffet dinner in Dubai, excluding beverages and AED 165 for lunch. The seafood section is specifically famous for its delectable variety of sushi, mussels, sashimi, shrimps, prawns and oysters. Serving hours for lunch are 12:30 pm – 3:30 pm and for dinner buffet are 6:30 pm to 12:00 am. Prior reservation is recommended. The Market Place offers you a fine dining experience of eating a vast variety of international cuisines. The dinner buffet will cost you around AED 150 per person including coffee and drinks. The place offers a great assortment of breakfast, lunch, brunch, and dinner buffet. The serving hours are between 7:30 pm to 11 pm, however the buffet is only offered on Mondays and Tuesdays. It is located at the Lobby Level, JW Marriott Hotel Dubai, besides Hamarain Shopping Centre situated over Abu Baker Al Siddique Road – Al Muraqqabat. The JW Marriott is one of the tallest buildings in Dubai and The Market Place is one of the best priced quality buffet restaurants in Dubai. The Cavendish Restaurant is one of the most affordable buffet restaurants in Dubai, that offers you European, International and British cuisines. The restaurant featured breakfast, brunch, lunch, business lunch, friendly and family dining, private dining, romantic dinning and buffet dining. Estimated average cost, including starter, main course meal and drink is approximately AED 150. Alcohol beverages are also served here. The restaurant is located in Bennigton Hotel, Cluster J, Jumeirah lake towers Dubai. Serving hours are 6:30 am to 11pm, Saturday – Friday. The Talk @ Movenpick is a great option for having international cuisines while enjoying your favorite drink. This quality buffet restaurant featured a great beach view dining ambiance and offers breakfast, lunch, brunch, family and friendly dining, private dining, buffet dinning accompanied with outdoor setting and great live music. It is located within Movenpick Hotel, Jumeirah Beach Residence. Serving hours are 6:30 am to 10:30 am for breakfast, 12 pm to 6 pm for lunch buffet in Dubai, and 6 pm – 11 pm for dinner on Saturday to Friday. Alcoholic beverages serve here and a prior reservation is recommended. These are some of the best priced quality buffet restaurants in Dubai that will definitely meet your appetite. To recommend a buffet restaurant in Dubai that offer a wide range of cuisines & a great ambience, please add your comments below.